historical event: Pope Saint John Paul II described the Universal Declaration of Human Rights as “one of the highest expressions of the human conscience of our time”. According to the Guinness Book of Records, the Universal Declaration of Human Rights is the world’s most translated document. The Declaration was adopted on this day in the year 1948 by a unanimous decision of the UN General Assembly at its session in Paris. The Declaration was drafted ​​by a committee headed by Eleanor Roosevelt (wife of the late U.S. President Franklin Delano Roosevelt). Among the committee members were Jacques Maritain (a famous Catholic philosopher) and Charles Malik (a Lebanese Orthodox Christian), but the main role was played by Canadian John Peters Humphrey. The Declaration contains 30 articles. The preamble states the need that all people have four basic freedoms: freedom of speech, freedom of belief, freedom from fear, and freedom from want. 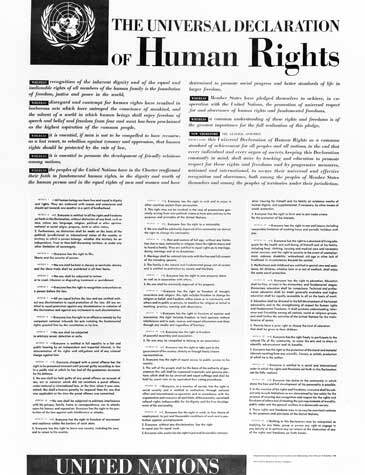 Pope Saint John Paul II described the Universal Declaration of Human Rights as “one of the highest expressions of the human conscience of our time”. On this day the International Human Rights Day is celebrated to commemorate the adoption of the Declaration.